DUNWOODY, Ga. -- Ten families are out of their homes after a fire ripped through a DeKalb County apartment complex. The fire happened at the Dunwoody Village Apartments off of North Peachtree Road. DUNWOODY, Ga. -- Dunwoody police are crediting the use of the overdose drug for helping to save a man's life. Wednesday, officers responded to a welfare check and found a man unconscious and unresponsive at The Drexel Apartments. According to a release, Sgt. Robert Parsons administered the department-issued dose of Evzio Naloxone. EMS issued an additional dose once they arrived. He was transported to a local hospital where he tested positive for opiods. Dunwoody police wrote in a release, "Due to Sergeant Parsons' quick response and action by administering Evzio Naloxone, the male is expected to make a full recovery. Ironically, Sergeant Parsons initiated the department's effort to secure the devices." DUNWOODY, Ga. -- Police in Dunwoody are investigating a suspicious death at an apartment complex. The investigation was underway Monday at The Barclay Apartments located at 4580 Barclay Drive. According to police, 24-year-old Ja'ron Acklin was found dead inside an apartment. Anyone with information on the death is asked to call police at 678-382-6916. This page will be updated with more information as it becomes available. Refresh for the latest updates! DUNWOODY, GA (WXIA) – Dunwoody Police are stepping up patrols near Dunwoody High School after officer say a student prank got out of hand Monday evening, leading nearby residents to call 911. Now, the school’s principal and police are cracking down with a stern warning for students. The principal held an assembly with students on Tuesday to talk about what happened on Monday night. It’s called “Junior-Senior Wars” and the school’s principal says it has been a tradition at Dunwoody High for the past few years. 11Alive News obtained a copy of the letter the principal sent home with students threatening suspension or expulsion for the continued behavior. Dunwoody Police are concerned that the activity could have been become more serious. An officer pointed out on Tuesday that there was one element that takes the events of Monday night beyond a harmless joke. DUNWOODY, Ga. -- Cindy Martinez is the local mom who lost a hand and both legs to a flesh-eating bacteria. 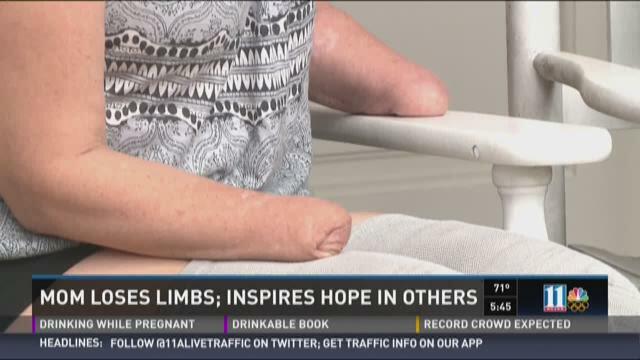 Her story of hope is one of the most shared articles on 11Alive’s Facebook page – and it’s serving as a source of inspiration. DUNWOODY, Ga. -- Dunwoody police report that a missing elderly man has returned home. Bonnie Swancy, 84, went missing around 4:15 p.m. He was last seen driving somewhere between the area of the Jim Ellis dealership on Peachtree Road and the Hertz car rental car on Perimeter Center Pkwy. Police said Swancy suffers from dementia and is hard of hearing. Shortly after they announced he was missing a Mattie's Call was issued to alert the public in hopes that he would be found unharmed. DUNWOODY, Ga. – Crews repaired a water main break in Dunwoody on Sunday. The break is on Kings Down Road, which is near Chamblee Dunwoody Road. According to police, water was shooting more than 50 feet in the air around 2 a.m.